The trouble with winter snowfall and rain is it brings many cloudy days and the sun can be a rare commodity. Well, I had these finished runner set aside and I was waiting for the sun to appear. I was ready, camera in hand! 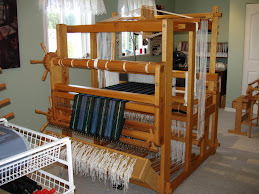 I was able to weave three runners, and all finished up as sixty inches long and fifteen inches wide. Two have hems and one has a twisted fringe (for variety). This time I wove a much longer hem allowance and after doing my usual turn overs, I must say I like it much better. I will add this to my repertoire for the future. The draft is a twelve shaft design based on a variation of M's and W's and I have used it before with great success. Normally it produces a series of medallions but I have isolated a portion of the treadling and repeated it. Its fully reversible. Hemstitching and a neat tight hand sewn hem means you are hard pressed to see which is the 'right side'. Does it matter? The weft used in this runner is taupe 8/2 tencel. Its suits the natural cotton but gives good contrast to show the pattern. The table runner below is also fifteen inches by sixty inches but has a three inch fringe. The weft is tencel again, this time one of the newer colours "birch". Its a lovely soft silvered green. The contrast is softer too. I really like this one! The last picture has the cloth flipped to show the reverse. The last runner was woven with 10/2 UKI Supreme mercerized cotton in a medium grey. Crisply twisted cotton makes for a totally different feel to the cloth and also a sharper definition of the pattern. Below is the reverse pattern. Both sides looks equally good to me! Both the taupe runner and the cotton runner are sold already so the new owner can decide which they like more. I have a new book acquisition; a belated Christmas gift. My daughter and SIL had given us an Amazon gift certificate and I chose this book based on Frances L. Goodrich's studies on early American Coverlets and Counterpanes. Its well thought out and printed on quality paper. My book is a gently used one but apart from a few minor scratches on the cover, its as new. I'm looking forward to making my way through and admiring Frances's work. That's her in the last picture. Her research efforts help us to understand our collective weaving past, and to know where you're going, you have to know where you have been. So, week ago we had lovely sunshine, warm temperatures and we were sitting outside sunning ourselves. Bruce did some small yard tidy up and we noticed the golfers were back on the course again. It was feeling like spring here on the Island! There's the BBQ that was fired up just three days before and we cooked supper on. With a large pot of home made soup simmering on the stove, we are now back to perfect weaving weather and I have been busy in the studio. You can't tell by the picture below but there are good tunes playing and weaving going on! There are newly completed table runners in to soak in the laundry room (show and tell next post!) and below is the warp for a new project for the Spring loom. 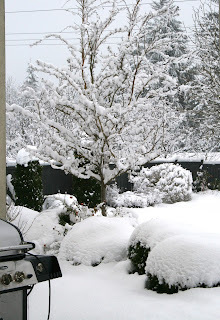 Hubby was going out at all hours trying to keep the driveway clear, especially after the plow had been through and buried the end of the driveway! 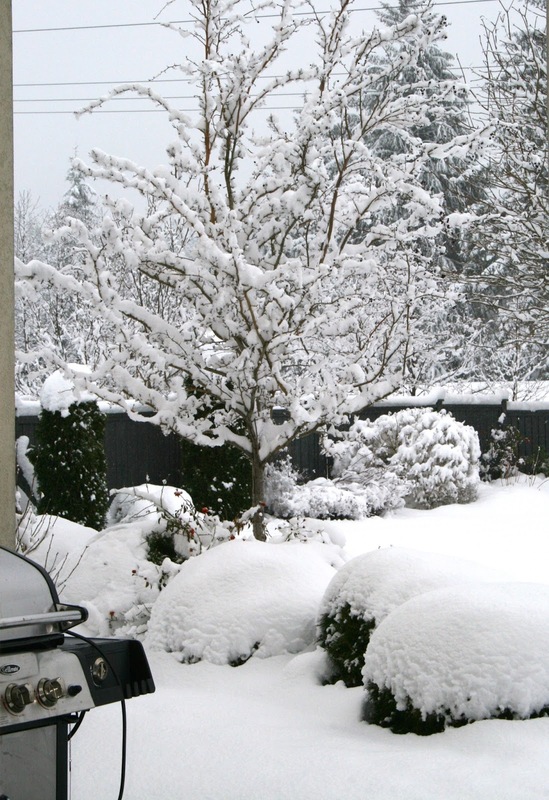 All kinds of winter weather records are being broken all across BC as it turns into a winter to remember!